BLADENSBURG, Md. — A ruling declaring a veterans cross memorial in Maryland to be unconstitutional will be appealed to the U.S. Supreme Court after the Fourth Circuit Court of Appeals declined to rehear the case en banc on Thursday. The vote to deny the request was 8-6. “Our holding that the State’s ongoing ownership and maintenance of the Bladensburg cross violated the Establishment Clause recognizes that to hold otherwise would require this court to accept the Commission’s conclusion that the Latin cross does not have the ‘principal or primary effect’ of advancing the Christian faith,” wrote Judge James Wynn. Judge Paul Niemeyer strongly dissented from the majority. “The panel … will now have the monument removed or destroyed because, as it concludes, its presence on public land amounts to a violation of the Establishment Clause, although no Supreme Court case has ever held that the Establishment Clause prohibits such monuments,” he wrote. He pointed to the 2005 ruling of Van Orden v. Perry, in which the U.S. Supreme Court held that a Texas Ten Commandments monument was indeed constitutional. “Specifically, the court held that ‘a large granite monument bearing the text of the Ten Commandments located on the grounds of the Texas State Capitol’ was allowed by the Establishment Clause, despite the court’s recognition that the Ten Commandments’ text ‘has a religious message,'” Niemeyer noted. He expressed concern that the ruling could result in not only the removal or destruction of the Maryland monument, but that it could potentially impact hundreds of other monuments as well. “The holding not only violates Van Orden, it also needlessly puts at risk hundreds of monuments with similar symbols standing on public grounds across the country, such as those in nearby Arlington National Cemetery, where crosses of comparable size stand in commemoration of fallen soldiers,” Niemeyer lamented. 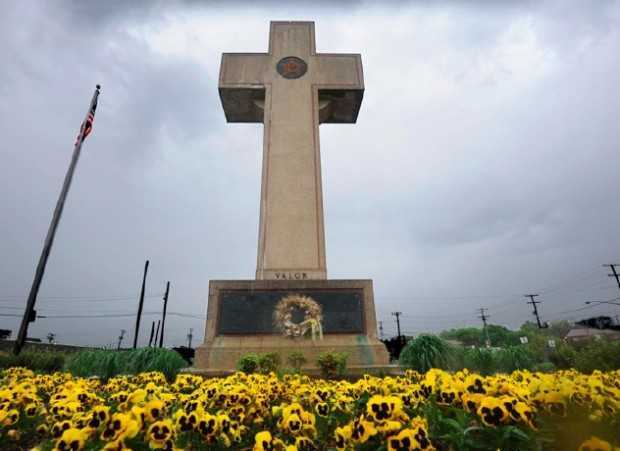 As previously reported, the Bladensburg World War I Veterans Memorial, also known as the “peace cross,” was erected in 1925 by the American Legion to honor the lives of 49 men from Prince George County who died during the war. The cross stands 40 feet tall in Memorial Park, and also features a plaque that reads, “The right is more precious than the peace; we shall fight for the things we have always carried nearest our hearts; to such a task we dedicate ourselves.” The site is mainly used by the American Legion for Memorial Day and Veterans Day celebrations. In 2014, the American Humanist Association (AHA) sued the Maryland-National Capital Park and Planning Commission over the presence of the cross, alleging that it violated the First Amendment to the United States Constitution. “When the government erects an exclusively Christian monument on government property, it violates this central command of the Establishment Clause by sending a clear message that Christianity is the preferred religion over all others,” said AHA attorney Monica Miller in a statement surrounding the filing of the suit. In November 2015, U.S. District Judge Deborah Chasanow, appointed to the bench by then-President Bill Clinton, ruled that the Bladensburg cross monument is constitutional because it is used for nonreligious purposes and is meant to honor war vets rather than promote any religious message. AHA then filed an appeal with the Fourth Circuit Court of Appeals, which ruled 2-1 in October that the veterans memorial is unconstitutional. It said that because there are no other religious symbols in the park, the memorial sends the message that the government favors Christianity over other religions. “Although the reasonable observer may recognize that the cross is located in the Veterans Memorial Park, such reasonable observer also could not help but note that the cross is the most prominent monument in the park and the only one displaying a religious symbol,” Thacker wrote. “Further, the reasonable observer would know that a Latin cross generally represents Christianity. These factors collectively weigh in favor of concluding that the Cross endorses Christianity—not only above all other faiths, but also to their exclusion,” she asserted. Judge Roger Gregory, nominated to the bench by then-President Bill Clinton, dissented, opining that most observers would simply consider the display as a veterans memorial and not the promotion of religion. He noted that the courts have ruled that it is not necessary to scrub all traces of religion from public life in order to remain neutral. The decision was appealed in November, requesting an en banc—or full appeals court—review. The rehearing was denied on Thursday. First Liberty Institute, which is representing the American Legion in court, says that it plans to appeal to the U.S. Supreme Court.